Many sororities are known for their big hearts, big personalities and big houses. After all, a house is meant to be a home. With that said you need a pretty big space to call home to so much passionate sisterhood. Sorority houses have grown quite a bit over the years from the meager, few-bedroom affairs rented in the early days of women’s college Greek organizations. A sorority house with 20 or more bedrooms is not totally unusual these days, with various additional wings and rooms to be used for pretty much every sorority activity you can think of. It’s easy to tell how big the typical North American sorority house has grown when you take a stroll down Greek Row, with behemoth sorority houses towering regally over the green grass hills, letters displayed prominently and proudly, harkening young women of all walks to join their ranks and step through those doors. 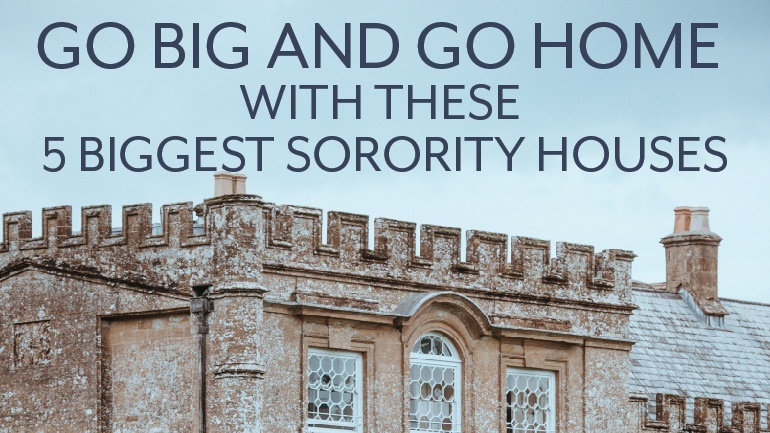 That’s why OmegaFi wants to let you know that you can Go Big AND Go Home with These 5 Biggest Sorority Houses. The Gamma Nu chapter of Kappa Kappa Gamma boasts one of the biggest sorority houses in the United States, clocking in at 46,350 square feet. Originally built in the 1920s, by renowned Fayetteville architect Warren Segraves, the house’s towering white pillars hint at the refinement inside, yet exude simple southern charm. In 2013 the house underwent renovations, adding on roughly 26,000 square feet of building and remodeling the existing 20,500 square feet. The renovation included the main entry with library, lounge area, dining room and kitchen. The house also includes a basement chapter room and study rooms, as well as 45 upper-story bedrooms with bathrooms. Once you walk into this home and see the massive chandeliers guiding you toward the dual iron-banister staircases, you’ll understand why the Kappa Kappa Gamma Arkansas house is considered one of America’s biggest. That house has since been torn down, and the new Pi Beta Phi house sits at 42,000 square feet with plenty of amenities for sisters and guests to enjoy. An important part of the old house known as “the marble” has been incorporated into the new house, as well as two fireplaces, including an old brick fireplace from the previous house. There is a new chapter room, 37 bedrooms to house 98 sisters, and many other attractive features. This house makes the list not only for size and style, but for the tangible links, lovingly preserved by its builders, to the historic sorority traditions that give it soul. When this new house for the Epsilon Lambda Chapter of Gamma Phi Beta opened its doors in 2015, it became the biggest in the sorority’s history. And the chapter’s new home comes well-deserved, as during that time they posted the highest recruitment numbers in the country two years running. Wow! The foundation sits on 40,000 square feet of Greek Row property as part of a University of Alabama expansion plan of Greek housing on campus. Its brick and pillared façade is intimidating, to say the least, and just as striking is the massive living space 68 young women call home. The house was built in part to create the atmosphere of a coffee shop, where sisters can study, hang out with one another or just chill. There’s also an impressive new kitchen, movie gallery and a quiet 24-hour study room. The pink and white furniture adds the perfect touch of elegance and fun to this big, beautiful sorority house. Pillars and brickwork are apparently a trend in the University of Alabama’s big sorority houses: They’re built sturdy and strong. Maybe that says something about the culture the university instills in its students. Certainly that seems to be the case for the Beta Psi chapter of Delta Gamma. Their four-story sorority house is one of the biggest at 34,800 square feet. Completed in 2012, the chapter house is home to 61 Delta Gamma sisters with rooms that are some of the largest on campus. The house also has a large dining area, snack kitchen, several living areas, study rooms and “anchor rooms.” The house has a regal interior design that truly lives up to the Delta Gamma name. Missouri is the “show me” state. The locals want common sense, not snake oil salesmen. Well, for Chi Omega, the proof is in the pudding. They’re to date the largest sorority, with 180 chapters across North America. They’ve been around since their founding at the University of Arkansas in 1895, though the honor of owning this big sorority house goes to the Rho Alpha chapter at Mizzou. This three-story house with dual chimneys is 33,557 square feet of pure sorority house, after a $4 million renovation in 2013. Updates include underground parking, more community spaces and even an elevator. This house is a perfect representation of Chi Omega: Big personality and unafraid to show it to the world. These are 5 of the Biggest Sorority Houses that’ll make you Go Big AND Go Home. Having a big sorority house doesn’t make a sorority chapter any more passionate, committed or valid as an organization than any other. However, having a big sorority house is pretty darn cool. Talk to us about sorority houses big and small in the comments below!